Including flights from Adelaide! Visit picturesque fjords and breathtaking vistas, plus a who’s who of Nordic and Baltic ports including Copenhagen, Tallinn, Helsinki, Stockholm and beyond, with an overnight stay in St Petersburg. Includes exclusive Phil Hoffmann Travel booking bonuses. From Amsterdam, journey north to beautiful Flåm. Witness the Scandinavian beauty of Sognefjord, in the heart of fjord country. Beyond Kristiansand and Stavanger lies Norway’s capital city, Oslo. Cruising south via the scenic Oslo Fjord, continue to Copenhagen, a city of historic canals, cobbled squares and copper spires. Be sure to try smorrebrod - rye bread with various toppings. Arrive in Tallinn, the capital city of Estonia. Tallinn’s UNESCO World Heritage-listed Old Town should not be missed. Filled with imperial palaces and grand boulevards, St Petersburg in Russia is famed for its White Nights: long summer days when the sun barely dips below the horizon. Be sure to visit the art collection at the Winter Palace, and Tsar Nicholas’s family pile, Catherine Palace. In Stockholm, explore the Old Town, Gamla Stan and the island neighbourhood of Sodermalm, lined with quirky shops and galleries. 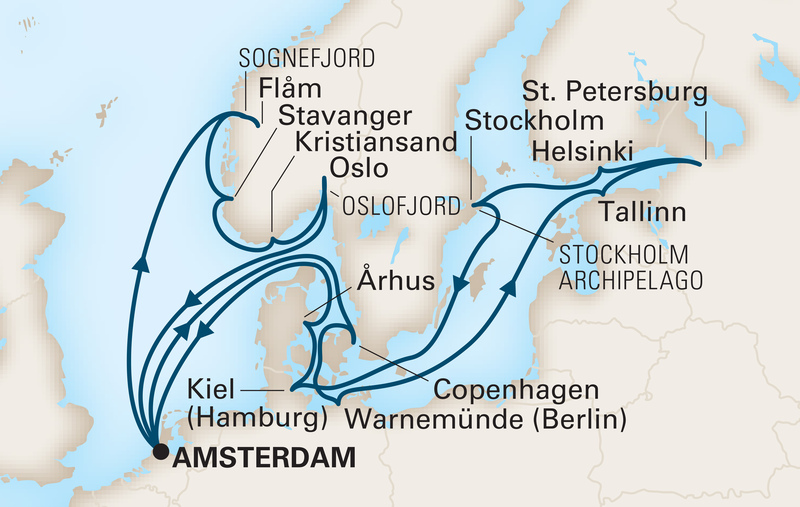 After exploring Hamburg and Denmark’s Arhus finish this wonderful cruise back in the city of Amsterdam.